If you are looking for some creative ideas for a healthy birthday cake, you’ve reached the right place. I’ll show you several beautiful alternatives to birthday (and wedding) cakes. A week on so ago, someone called me looking to have a watermelon cake made. In Ohio. I referred the caller to Svetlana Partem who I first met when she was a student. Since we first met, Svetlana has become an excellent carver. The very next day, Svetlana sent me this photo of this gorgeous fruit cake that she made. This same design would be perfect as a healthy birthday cake or for a wedding, a bridal shower, or any other special occasion. 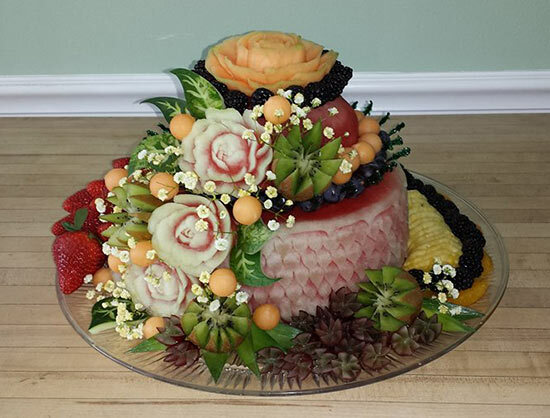 Svetlana Partem made this fancy watermelon cake. Isn’t it beautiful? She used on of my ideas that I introduced a while back and made it even fancier and prettier. Svelana did an outstanding job didn’t she? 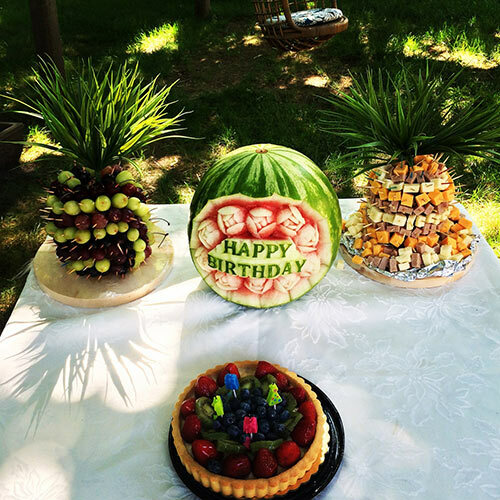 Here is another of Svetlana’s skillfully carved birthday watermelons. 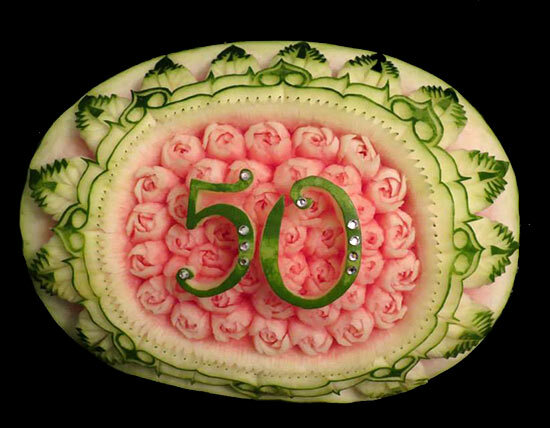 Svetlana Partem is the talented carver who made this intricate 50th birthday watermelon carving. In addition to her skillful carving, don’t you love how she added a touch of bling on the number 50? This double tiered watermelon cake was created by student/customer Lan Nguyen who just started learning to carve with my lessons 3 months ago. 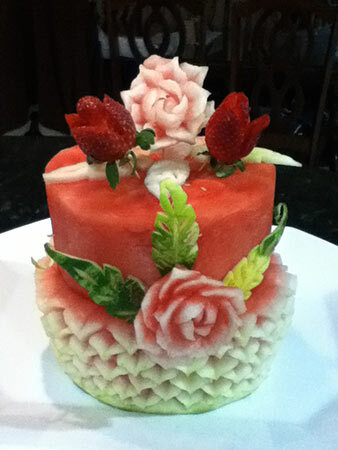 This lovely carved watermelon could serve as a healthy birthday cake, wedding cake or any special occasion cake. Pretty, isn’t it? 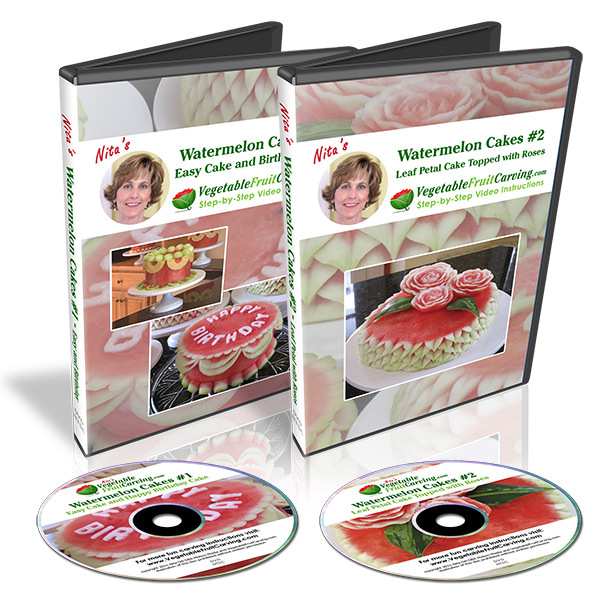 The elements of this watermelon cake are taught in my video lessons, Watermelon Cakes #1 and #2. 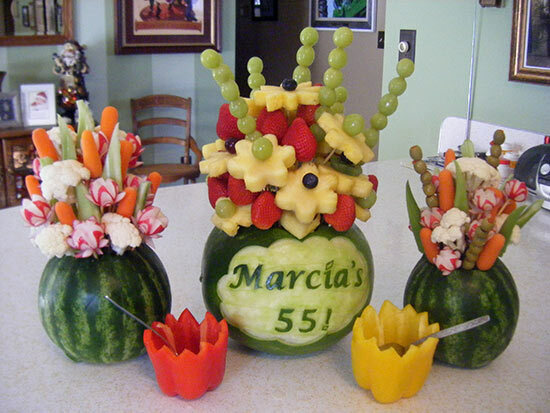 These colorful fruit and vegetable bouquets were created by customer/student turned pro, Cindy Rozich to celebrate a 55th birthday. 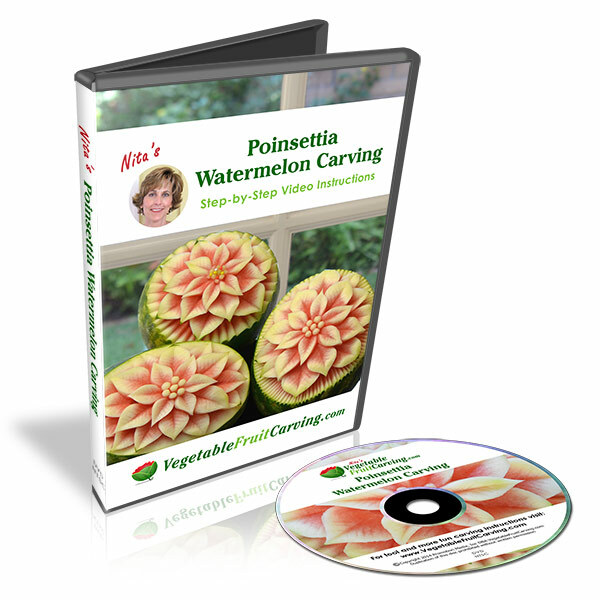 You can learn to carve words onto watermelons in my video lessons, Carving Letters and Words. Our Pattern Transfer Paper and Fabric makes carving words and letters, faster and easier. 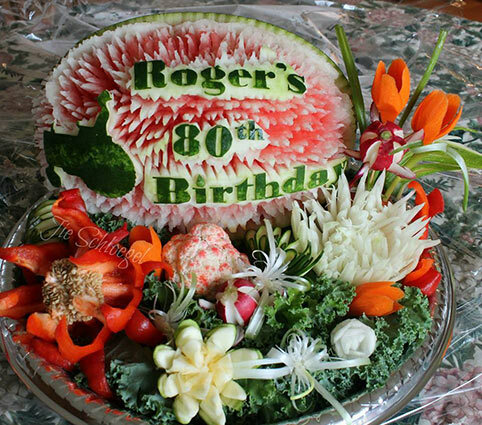 Customer Josephine Schloegel made this pretty carve fruit and vegetable display to celebrate an 80th birthday. 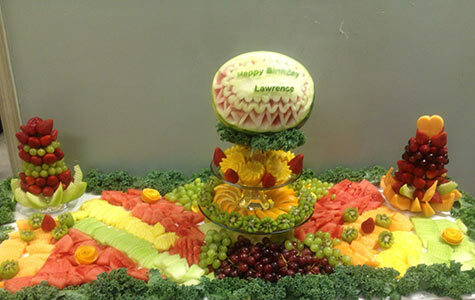 Customer/student Wilma Silva carved a pretty watermelon for a centerpiece and decorated pineapples with bites of fruit, meat and cheese for this birthday celebration. This photo sent to me by customer Christelle Ngounou shows how you can create a beautiful raised fruit centerpiece for a whole table of fruit. If you choose to create a table of fruit like this, just make sure that it’s stable and not top heavy. It would be a disaster to have a display like this fall during a birthday party or other special event. These photo should give you some ideas for making your own healthy birthday cake. 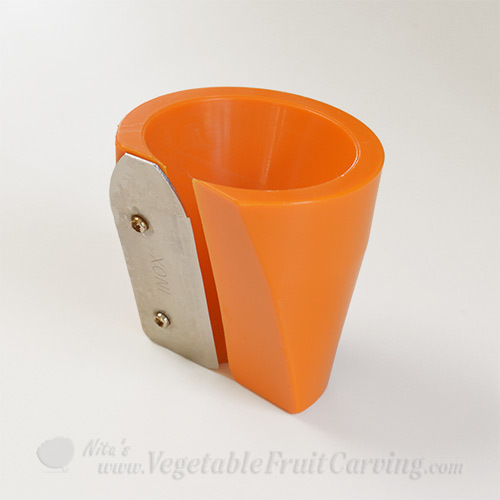 You’ll find lots more photos of fresh fruit birthday cakes on our blog by clicking here. Happy Carving! It’s really lovely looking like bakers cake .It’s eye catching. wow these cakes are better looking then those from the bakery. love them.